We enjoyed a one night stay. 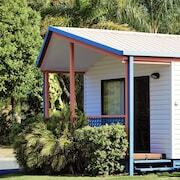 Our family consists of 2 adults and 4 kids and we fit into a deluxe cabin nicely. It was clean and tidy and the location was great. The kids loved the freezing dip in the pool! Great hotel, will be great when there’s some more shops closer by! Large room with very comfortable bed Unusually large room you don't see much at this price point. 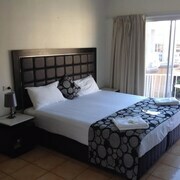 Very comfortable queen bed and pump pack of shampoo, conditioner, soap etc. a great touch. Also had microwave - bonus. Fantastic value for money Excellent service, quality and comfortability. Would highly recommend and will be returning. Under aircraft approach but not heard inside room. Staff lovely and breakfast excellent. Stop living through your mates' over-saturated travel pics. 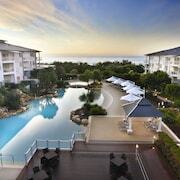 With so many hotels in Tweed Heads to choose from, it's your turn to get your own envy-inducing holiday on. Sleep near the action if you want to experience this destination's true buzz. 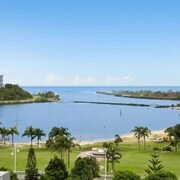 lastminute.com.au offers 58 hotel options within 5 kilometres of downtown Tweed Heads. Did someone say 'spoiled for choice'? If you want to chillax near the city's centre, the Reflection on the Sea and the Reflection Tower Two are no-brainers. 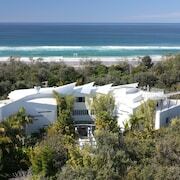 Why not also think about the Mantra Coolangatta Beach and the Kirra Beach Apartments? You can find 28 accommodations in the well-known neighbourhood of Coolangatta, only 3 kilometres from the CBD. 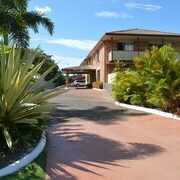 The Points North Apartments and The Sebel Coolangatta are a couple of recommended places. Plan an afternoon out at Kirra Beach and breathe in the sea air as you soak up the sun. Need a bed for the night close by? Don't stress, we've got you covered. Oceanside Resort and Tweed Ultima are pretty much around the corner! At North Kirra Surf Club, patrons can meet up for a meal, and some recreational activities. If you'd rather hang out near this attraction, take a squiz at the San Simeon Apartments and Mantra Twin Towns. You might also like to check out the Palazzo Versace or the Peppers Soul Surfers Paradise. The Palazzo Versace is 25 kilometres away from central Tweed Heads, and the Peppers Soul Surfers Paradise is 20 kilometres away. We'd also recommend the Ultra Broadbeach and the Peppers Broadbeach. The first is 18 kilometres from downtown, while the second is 18 kilometres away. Always on the lookout for your next awesome adventure? You'll be happy to know that the wider Northern Rivers region has some spectacular things to see and do as well. Outdoorsy types should plan an outing to Tweed Heads' amazing beaches. A few other gotta-sees to stick on your hit list are art galleries, craft workshops and lighthouses. Additionally, if you’ve always wanted to go mountain climbing, you'll have the opportunity to in this part of Australia. It's well known that Aussies are pretty relaxed, so consider hanging round a little longer and going to the Kingscliff War Memorial and Fingal Lighthouse in Kingscliff, 11 kilometres to the southeast of Tweed Heads. Some of our recommended Kingscliff accommodation options include the Santai Retreat at Casuarina Beach and Mantra on Salt Beach. 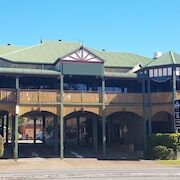 Or, you could stay in Duranbah, 14 kilometres to the south of Tweed Heads, where you can pick from the Cotton Beach Resort - Tweed Coast Holidays and The Beach Cabarita. In2Surf Surf School and the Tropical Fruit World are some of the most popular points of interest to explore for those visiting Duranbah. Wash off the long-haul hangover with a long bath at the Novotel Brisbane Airport. It's within an easy commute of Brisbane Airport (95 kilometres from central Tweed Heads), so you'll be feeling back to normal in no time!